Nomad Outland Whisky is a popular Whisky available from TheDrinkShop in 70cl to buy online. Visit TheDrinkShop for the best price for 70cl of Nomad Outland Whisky or compare prices on our other Whisky products. After a year of tests, ageing the Whisky in barrels that had previously held Fino, Oloroso and Pedro Ximenez sherries, to find the perfect blend, master blenders chose those whiskies that had been aged in Pedro Ximenez barrels, in Jerez, which produced a wonderfully smooth and rounded whisky that stood out from the rest. Many whiskies are aged in sherry casks in Scotland but Nomad is the only whisky in the world to age in the Gonzalez Byass cellars in Jerez, coming into contact with the wild yeasts and flors that imbue the bodegas, and their contents, with the unique characteristics that make this whisky so special. A unique formulation with over 30 different single malt and grain whiskies, blended in the Highlands of Scotland, using whiskies sourced principally from Speyside. This original blend is made up from whiskies of between 5 and 8 years old which are left to mature in sherry butts in Scotland for 3 years, altogether, before being transferred to Jerez to be aged in the San Fernando cellars of Gonzalez Byass for a minimum of 12 months. 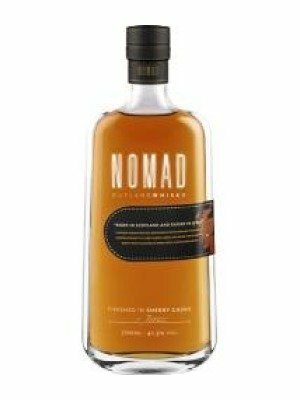 Where to buy Nomad Outland Whisky ? Nomad Outland Whisky Supermarkets & Stockists. You can buy Nomad Outland Whisky online in most retailers and find it in the Whisky aisle in supermarkets but we found the best deals online for Nomad Outland Whisky in TheDrinkShop, DrinkSupermarket.com, Waitrose Cellar, and others. Compare the current price of Nomad Outland Whisky in 70cl size in the table of offers below. Simply click on the button to order Nomad Outland Whisky online now.